The Veneto region has captured the hearts of writers, artists, filmmakers--and tourists. Approximately 20 million visit Venice, its largest city, each year. But what would you uncover if you knew how to visit like an insider? Imagine staying in a restored medieval castle nestled in a tiny mountain village, or learning to cook in the kitchen of a count and countess’s 15th-century villa. You could visit a boutique olive oil producer in Lake Garda, enjoy a tutored tasting of Prosecco, Amarone, and other regional wines, and make pasta with chefs from a trending Italian restaurant. 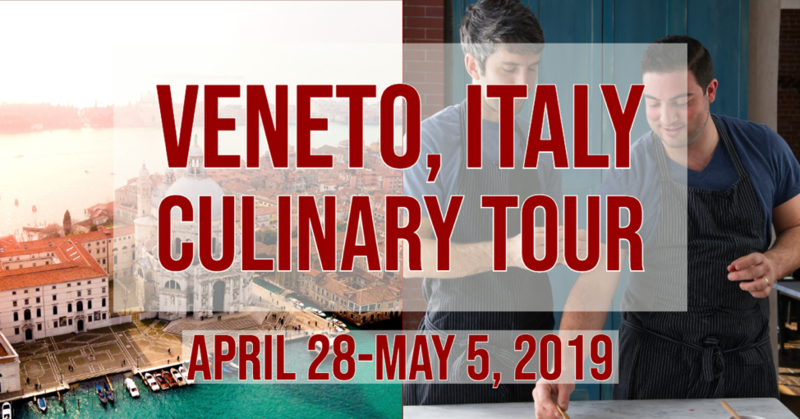 You can experience this in the Veneto, April 28-May 5, 2019, with Oldways and chefs Kevin O’Donnell and Michael Lombardi of the acclaimed SRV restaurantin Boston. Oldways culinary tours take small groups of travelers off the beaten path. Each tour is led in partnership with a culinary expert or chef, planned with a ﬁrm belief that the heart of any culture can be illuminated by exploring its food, wine, and culinary traditions. The guidebooks can show you the beautiful but well-traveled sites in the Veneto. But are you eager for more? Here’s how to tour as an Italian chef would--uncovering the foods, wines, and traditions that make this region so unique. After you’ve strolled along the canals of Venice, taken in the sights and sounds at the Rialto Market, and seen the gilded domes of St. Mark’s Basilica, duck into a bacaro like a local would. Find your way into an authentic bacaro, and you’re in for a treat: cicchetti. “Cicchetti is the small bites one would eat while standing in a wine bar in Venice,” explained chefs Kevin O’Donnell and Michael Lombardi of SRV restaurant in Boston. These tapas-like small plates include marinated olives, baccala mantecato (salt cod) and polpette (meatballs), all of which can be found in authentic bacari across Venice. Casa di Giulietta, the stunning 13th-century home said to have inspired Shakespeare’s Romeo and Juliet, draws flocks of tourists seeking a little romance. With a stone balcony, authentic Gothic architecture, and a story like no other, this spot is understandably at the top of many sightseeing lists. But Verona’s storied past extends far beyond Romeo and Juliet. A stroll through Verona’s streets reveals breathtaking Roman-era architecture. The Arena di Verona, the Roman amphitheater, dates back to 290 AD. If you’re visiting in the summer, catch performances during the annual Opera Festival, a celebration that began in 1936. With the ancient architecture and open-air ambiance, it’s another truly romantic Verona experience. Not far from Verona lies Lake Garda, Italy’s largest lake surrounded by abundant olive trees. In addition to exquisite scenery, this region offers insight into the importance of olives and olive oil in Italian culture. The best way to learn is to visit a producer yourself (and even better if you get the chance to go behind-the-scenes!) Oldways will take travelers to a small producer to see how the olives are harvested, pressed, and produced. Travelers will get a guided tasting to distinguish what makes this high-quality, freshly pressed oil so different from other products. DO enjoy a glass of Prosecco, but DON’T forget Valpolicella, Soave, and Amarone. Prosecco is the most famous of the Veneto’s wines. Produced throughout the region, truly authentic Prosecco is labeled with a DOC or DOCG designation to indicate authenticity of origin. No trip to the Veneto is complete without it—that’s why the Oldways tour will begin with a Prosecco tasting on the first night. But that’s only the beginning. 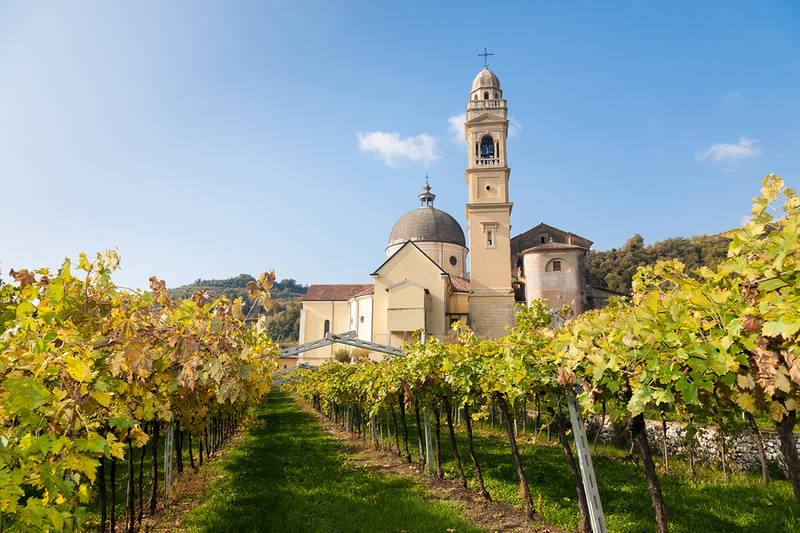 Valpolicella is a lively and light red wine, often compared to Beaujolais and said to have sour cherry notes. Amarone is made with dried grapes, concentrating its sugars. Full-bodied and rich, it often pairs well with meats and heavier dishes. Soave is a crisp and dry white wine that is easy to drink and pairs well with most foods. Wineries, if you know which ones to tour, can offer even more than a taste of their products. Catch stunning views of the countryside from atop a vineyard hill, or get a peek into history while touring ancient wine cellars and historic estates. You’ve enjoyed tastes of Grana Padano and real Asiago, but have you ever wondered what distinguishes theses artisan cheeses from their mass-produced counterparts? Authentic production actually begins with the land. That’s why Oldways will take travelers up into the hills between Venice and the Dolomites Mountains to visit the producer Monti Trentini. Located in the Trentino dolomites region, a World Heritage Site, all Monti Trentini cows are grazed in these stunning woodlands, pasturelands, and mountain meadows. Walk the land, meet the cows, and get a firsthand look at production, and you’ll begin to understand the true cultural significance of artisan cheesemaking. It’s one thing to taste excellent food--and another thing entirely to learn how to make Italian food in Italy.The chefs from SRV in Boston will lead cooking demonstrations of beloved regional dishes in the kitchen of a luxurious, 15th century estate. Then a few days later, step inside a Verona cooking school to cook alongside the chefs in a hands-on cooking class. At restaurants, develop a greater appreciation for local cuisine with carefully planned menus and glimpses into kitchens and production areas. Travelers learn the local tastes and traditions best by trying what is local, in season, and by meeting with the chefs themselves! Come to the Veneto with Oldways! Ready to see the Veneto through a chef’s eyes? Join Oldways, O’Donnell, and Lombardi from April 28-May 5, 2019. We’ll be based in two very diﬀerent places—the historical city of Verona, and Cison di Valmarino in the mountains northwest of Venice. Visit food and wine producers, enjoy guided art and architecture tours, and savor the region’s splendid wines and ingredients through incredible meals and cooking demonstrations. We’ll also spend a full day exploring the markets, canals, and cultural sites in the city of Venice. Where would you like to go? Across the globe, our network of contacts enables us to put together itineraries unlike any other. On an Oldways tour, you may ﬁnd yourself sitting on a carpet in a Berber tent in Morocco, trying your hand at shaping orechiette pasta in Italy, or strolling through a pistachio orchard in Turkey—experiences you would be unlikely to encounter on any other trip. Each is carefully planned to illuminate the healthy and sustainable joys of the old ways of eating.